A delicate Israeli folk song, Erev Shel Shoshanim gives the open feeling of the desert at night while the scent of roses drifts on the cool air. Vocals weave in a sensitive arrangement complemented by a fluid, but not difficult piano accompaniment. 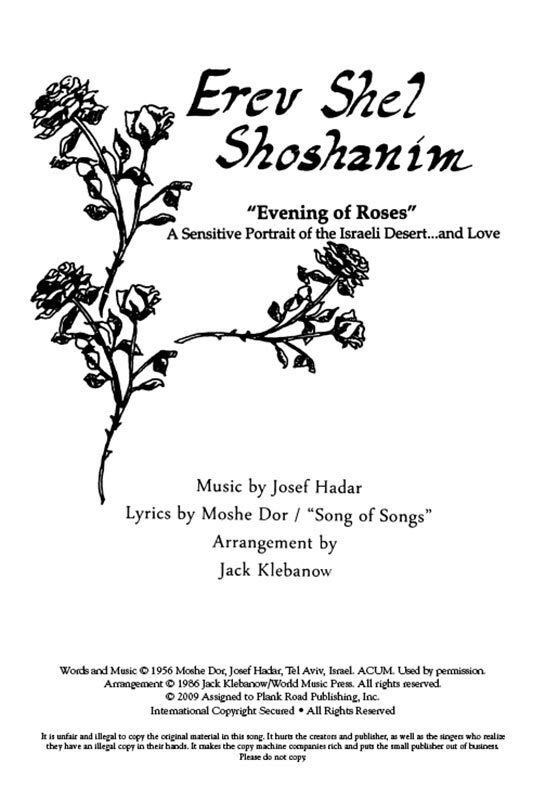 Lyrics by Moshe Dor, music by Joseph Hadar, and arrangement by Jack Klebanow. Translation; pronunciation; SATB; 8-12. The demo CD available for this tune simply contains a sample performance. It does not include an accompaniment track.